Recycling for Charities (RFC) benefits charities and the earth at the same time by collecting used electronic devices such as cell phones, PDA's, Digital Cameras and iPods. RFC was founded on a commitment to protect the environment by ensuring proper disposal of electronic items. Money raised by RFC from recycling used electronics is in turn donated to over 800 charities nationwide. To date we've helped keep over 2,000 tons of e-waste out of landfills. Now Recycling for Charities is going to make waves in a "Smart" kind of way. To take our mission to the streets we've recently launched a mobile donation and education effort. The mission is to raise awareness for our charity while increasing donations of used electronics and educating the public about the benefits and need for recycling. In our freshly wrapped Smart Car, we're hitting the streets of Southeast Michigan attending sporting events, festivals and charity fundraisers. The RFC Smart Car will also be available for special events organized by participating charities. Exposure - The RFC Smart Car is on the road seven days perweek and participates in numerous events each month. Your company will benefit from continuous exposure across a wide cross-segment of consumers. Publicity - To launch the mobile initiative RFC will carry out an aggressive PR campaign in print, online and broadcast media. Sponsors will be included in all PR and marketing related activities. Green - Companies today need to be good corporate citizens. Aligning your company with RFC provides a charitable donation and a green/environmental friendly benefit. RFC is offering various levels of placement sponsorship on our vehicle. To be considered your company must have a green component. 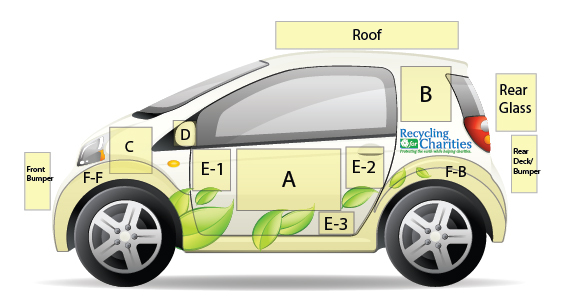 If you would like more information on becoming a sponsor, or having the RFC Green Smart Car show up for a recycling presentation at your school, office or event please click here to request a information packet.